An extraordinarily versatile communications talent, Kenny works for clients large and small as a voice actor, copywriter, on-camera video talent, and composer- producer. Some of the most complex projects involving voice and music are no problem for Kenny and his partners. 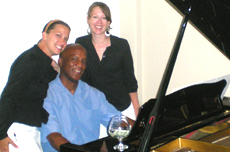 Kenny has been a restaurant and private function pianist in Southern New England for more than 2 decades – delighting audiences with his signature blend of soft rock, smooth jazz and classical piano. Check him out on iTunes and YouTube! Search “Kenny Adamson” for Kenny’s unique and eclectic compositions on iTunes. Kenny works on an impressive array of voice and music projects. Kenny served as project manager, lead voice talent, copywriter, and composer for a complex voice acting, copywriting and music production embedded in an internationally distributed consumer electronics product. Senior Product Area Manager, Monster Products, Inc. (consumer electronics). Kenny is a gifted pianist-composer. Owner of “2hopewell bistro and bar”, South Glastonbury, CT.